We all know graphics card software can be a tad hateful at times, but AMD is (hopefully) about to make the lives of its Radeon Software users just a teensy bit better. Say hello to the all-new Radeon Software Adrenalin Edition. Launching today, AMD’s promised its new Adrenalin Edition will be “the most significant” feature update it’s ever done. That includes a few minor performance tweaks to get the most out of your current card, but the bulk of the update comes from its improved toolset for managing your card’s power, frame rate and streaming capabilities. It’s also been “really artfully designed” to be “utterly beautiful” and intuitive. Yes, I gagged a little as well. Behind all the marketing speak, though, there are real upgrades to be found here, particularly if you’re one of those aforementioned streamers who likes real-time updates on your PC’s performance. 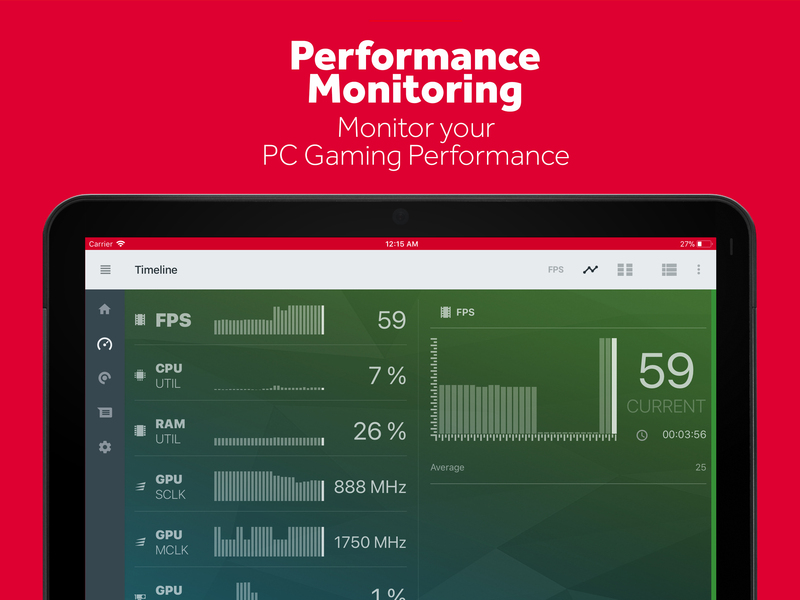 For launching alongside the Adrenalin Edition is AMD’s brand-new mobile app, AMD Link, putting lots of things you’ll find in Adrenalin right into the palm of your hand. You’ll need to be in the same Wi-Fi network as your PC in order for AMD Link to work correctly, but once you’ve connected your iOS or Android phone/tablet to your PC via a simple QR code, you’ll be able to use your mobile device as a secondary screen to track your PC’s performance. This includes bar graphs to monitor FPS and system health, and you’ll also be able to see whether any new updates are available via the notification tab. You can also use AMD Link to control AMD’s HDR/streaming tool, Radeon ReLive. In the main Adrenalin software, you’ll find this under a new Connect tab, providing a one-stop shop for all your screenshots, videos and social and streaming needs. Media will now appear as small thumbnails, and you’ll be able to trim, open and delete them in-app, as well queue uploads to multiple platforms, take screenshots and use its one-touch button to capture, stream and look back at instant replays. You can also share them to social media with a single click or tap. That’s not all that’s new to Adrenalin, either. Back in the PC version of Adrenalin, you’ll find options for chat integration for Twitch, Facebook, Mixer and YouTube, allowing you to see viewer reactions via an in-game overlay instead of having to divert your attention to a second screen or window. There’s borderless region capture support, too, so you can capture a window instead of an entire screen, plus new chroma key tools to make webcam backgrounds transparent while you’re recording or streaming. Adrenalin also supports AMD’s Eyefinity tech so you can capture across multiple monitors, and you can even separate your audio tracks to make editing your microphone track easier. Other much-clamoured-for features include the ability to save and load your own power management profiles using AMD’s Wattman settings, and being able to turn AMD’s FreeSync tech on and off per game. AMD’s also widened support for its Radeon Chill tech, which dynamically regulates the frame rate based on your in-game movements in order to save power – handy if you like playing a lot of slow-paced games or inching along the end of a sniper rifle sight, but otherwise you probably won’t notice it. More useful is the increased support for AMD’s Enhanced Sync. In AMD’s own words, this is essentially “a poor man’s FreeSync,” allowing you to enjoy the benefits of minimised screen tearing and smooth gaming at unlocked frame rates without owning a FreeSync monitor. Before, it was only enabled on a handful of Radeon Graphics Core Next (GCN) products, but now it supports all things GCN (basically everything AMD’s currently selling) as well as Vulkan, EyeFinity, laptops and multi-GPU setups. Now that’s what I call being in sync. 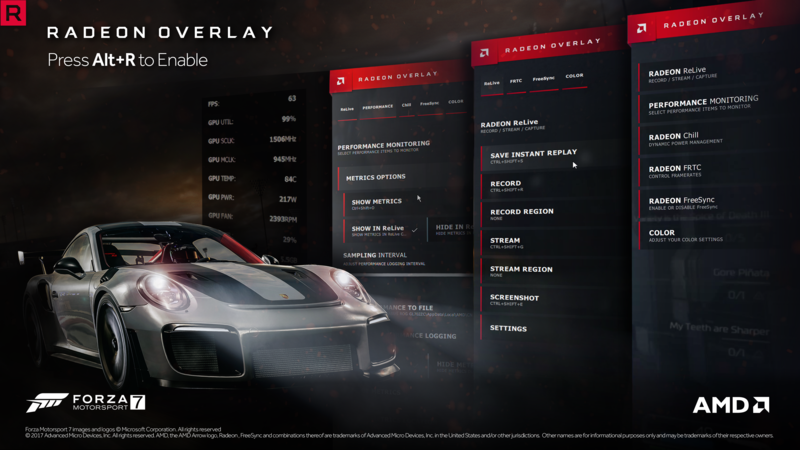 You don’t have to stop gaming to access all these features either, as Adrenalin’s new Radeon Overlay (pictured above in shiny infographic form) gives you access to everything in-game. Just press Alt+R to enable it, and you’ll see a drop-down menu for ReLive, performance monitoring, Radeon Chill, Radeon frame rate target control, FreeSync and colour settings. Tagged with AMD, AMD Link, AMD Radeon Software Adrenalin Edition, Hardware.